To configure time settings for your USS Gateway, click Configure ⟶ Settings ⟶ Time & NTP. The Time & NTP section allows you to set the local time of the USS Gateway server. This is important, especially if you intend to use Active Directory authentication. The timezone that best describes the location of the USS Gateway server. To ensure the server clock is always up to date, we recommend you use NTP (Network Time Protocol). Enter your preferred NTP server here (hostname or IP address). 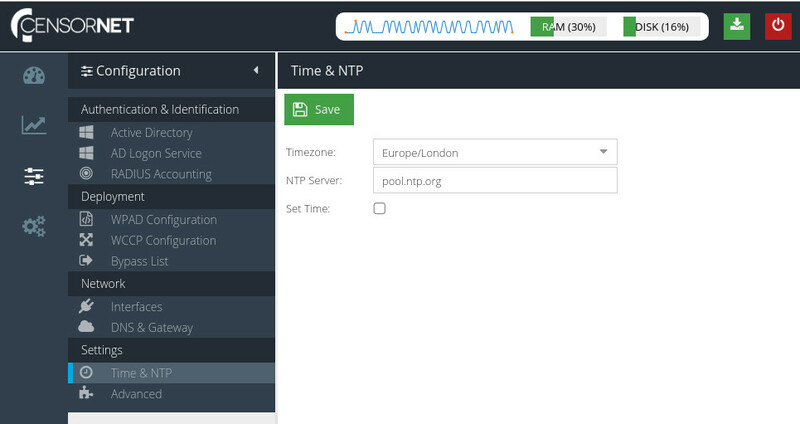 If you're unsure, just accept the default of pool.ntp.org. If you wish to set the server time manually, check this option and enter the correct time. Setting the time manually will override any other setting in this section. To configure advanced settings for your USS Gateway, click Configure ⟶ Settings ⟶ Advanced. These options should only be changed if you understand the effect. Please contact your Service Provider for further assistance. Many modern websites, particularly Search Engines and Mapping sites, use lots of background web requests to suggest terms and locations. On a large network with many users, this can add up to a significant amount of extra processing and log entries, which provide little benefit. This options filters the out these types of request, which should increase performance and also reduce the noise visible in the Web Security reports. Creating a key for every new Diffie-Hellman handshake is the most secure method, but the key creation is CPU- and disk-intensive which creates additional overhead. On very large networks, this can cause gateway resources to be consumed very quickly. This option can be used to toggle the new key creation mode to suit your requirements.